When Did We Start Using the + and - Signs? Though most people in this world never want to think about math after high school, let's talk about its symbols. 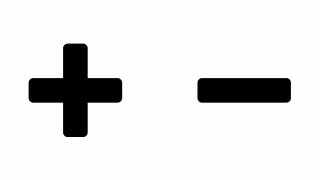 Where and when did the symbols for addition and subtraction get invented? We don't even question them when we see them now. But what the heck did people use before that? Mario Livio, an astrophysicist with a curious mind, discovered that the + sign was a pretty recent development. He says there's little doubt that the + sign is rooted in the Latin word 'et' (which means and). Using + as an abbreviation for et was probably first done by astronomer Nicole d'Oresme in the middle of the 14th century. Thank you d'Oresme for being lazy enough to condense two letters into a + so that the rest of the lazy world will never have to write et in math again. The rest of us appreciate it very much. The first use of the modern algebraic sign – appears in a German algebra manuscript from 1481 that was found in the Dresden Library. In a Latin manuscript from the same period (also in the Dresden Library), both symbols + and – appear. Johannes Widman is known to have examined and annotated both of those manuscripts. In 1489, in Leipzig, he published the first printed book (Mercantile Arithmetic) in which the two signs + and – occurred. The fact that Widman used the symbols as if they were generally known points to the possibility that they were derived from merchants' practices.